The Ronin 2 is the latest and most advanced multi-axis gimbal from DJI. With a 13.6KG payload capacity and newly designed high-torque motors, the Ronin 2 can handle a much greater range of camera and lens configurations than other, comparable gimbals. For example, the Ronin 2 can comfortably support the ARRI Alexa Mini and a Cooke Anamorphic /i lens along with accessories such a mattebox and wireless follow focus. 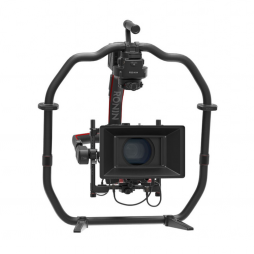 It is also highly versatile and can be configured for a wide range of shooting scenarios including handheld, Steadicam, crane, car mounting and cable-cam mode. Our comprehensive DJI Ronin 2 rental kit includes 6 x TB50 batteries as standard (additional batteries are available upon request), a remote controller, power/data cables for RED and ARRI cameras and a CineMilled Universal Mount (for Steadicam use). 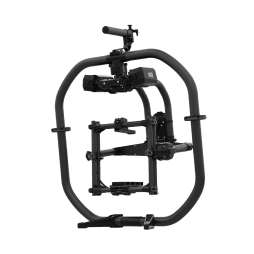 For increased support when operating the Ronin 2 in handheld configuration, we also offer the Ready Rig GS and ProArm gimbal support system. 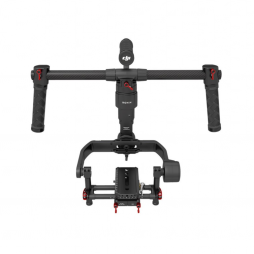 The Ronin-M is an ultra lightweight 3-axis gimbal which is rated for camera payloads of up to 3.6KG. It is particularly recommended for using with DSLR style cameras such as the Sony A7SII and Canon 5D. Fast to set up and featuring three intuitive operational modes, the Ronin-M offer an effective camera stabilisation solution when space & weight make using a larger gimbal system unsuitable.